Prices, commisions, and inquiries... contact me. …the blue of the Aegean, the rhythm of the winds, dreams… experience, hopes, desires. Argie Agelarakis is a Part Time Faculty member at Adelphi University and the School of Visual Arts. Drawing from her experience in the fields of archaeology, anthropology, and art, she teaches classes in technical drawing, scientific illustration, food-culture-and art, ethnobotany, and courses that explore the relationship of art, science, and math. Working as an illustrator, creating images published in journals and books relative to archaeological and bio- archaeological, forensic and medical illustration, calls for accurate renditions, true or almost true in color, feel, and nature of the particular subject. When working as a fine artist, her work is influenced by her technical drawings, but also breaking free form them. The beauty of the simplest forms found in our natural environment, particularly the sea, stimulates her creativity. 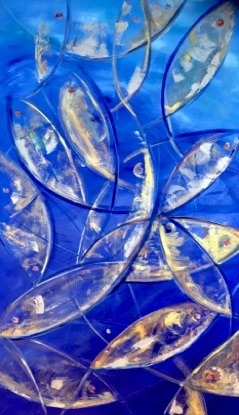 The palette is often surreal, abstract, as is the subject, and her aim is to create, through a wide range of media, a rhythm or harmony of color, form and composition. The intention is to entice the viewer, not simply for a glance, but for several moments, to absorb what they see to feel what they feel, when standing before the piece and to leave feeling provoked, inspired, stimulated and/or informed.